Nearly half of the world’s population now lives in urban parts and their restless lifestyle is leading to radically changed eating habits, wherein packaged food products are preferred for their convenience. From the production facility to the table of consumers, food products need to be packaged in a way that their nutritious values are preserved and retort packaging provides for an adequate mode of increasing shelf-life of the products. With retort packaging, food products are cocooned in special carrier film which can withstand thermal processing temperature of around 130 degree Celsius, and in turn neutralizes all unwanted micro-organisms. According to this business and commerce report, in terms of value, the demand in the global retort packaging market will propagate at notable CAGR of 7.45% during the forecast period of 2017 to 2024. Revenue-wise, it has been estimated that the opportunities in the global retort packaging market will translate into US$24,706.0 mn by the end of 2024, substantially up from its evaluated worth of US$14,945.0 mn in 2017. In terms of volume, the study has projected the demand to expand at a CAGR of 6.7% and produce a demand for 72,492 mn units by 2024. Striking benefits of retort packaging over conventional packaging, such as light weight, convenience, aesthetic appeal, and hygiene are the primary factors that are driving the adoption. In addition to that, increasing demand for ready-to-eat meals, innovations in packaging of baby and toddler food, and mushrooming of supermarkets and hypermarkets across urban areas are some of the other factors augmenting the demand in the global retort packaging market. On the other hand, stringent environmental regulations pertaining to the application of HDPE and PVC is one restraint that is curtailing the prosperity of the retort packaging market. That being said, relentless research and development activities that are currently underway to devise ecofriendly packaging material are anticipated to pave way to new opportunities in this market in the near future. The report also analyzes fresh trends of increasing preference of high-barrier transparent films and stand-up pouches, which are foreseen as an alternative for aluminum cans and trays. On the basis of product type, the retort packaging market has been segmented into: pouches including stand-up, spouted, back-seal quad, and gusseted, cartons, trays, and others such as bottles and cans. As of 2017, the pouches segment had the highest demand, with stand-up pouches the key sub-segment. By the end of 2024, stand-up pouches are estimated to generate a demand of 16,472 units or a revenue of US$7,562.1 mn. Stand-up pouches go a long way in catching the attention of customers at a retail outlet and thereby drive sales. Additionally, these pouches can be filled even with moderately moist food and are capable of maintaining commercially viable shelf-life. Among other product segments, the retort packaging market is expected to gain demand for trays at an above-average CAGR of 8.4% during the forecast period of 2017 to 2024. Material-wise, the market for retort packaging has been bifurcated into nylon, cast polypropylene, aluminum foil, paper and paperboard, polyethylene (PE), polyester (PET), and others such as polyvinyl chloride (PVD) and polyvinylidine chloride (PVDC). Among these, cast polypropylene and polyester are two segments that are showing greatest promise. While the cast polypropylene segment is estimated to be worth US$5,261.8 mn by the end of 2024, the demand for the polyester segment is projected to expand at an above-average CAGR of 8.5% during the period of 2017 to 2024 to attain a valuation of US$4,634.2 mn. The substantial demand for cast polypropylene market can be attributed to its excellent adhesion with aluminum and high moisture barrier properties. The report also classifies the retort packaging market on the basis of form into rigid, flexible, and semi-rigid as well as by application into food, beverages, and pharmaceuticals. The food category has been further divided into baby food, ready-to-eat meals, pet food, sea food, soups and sauces, and others such as meat stew. Geographically, Asia Pacific, Europe, and North America have been identified as the three regions with maximum potential, respectively. 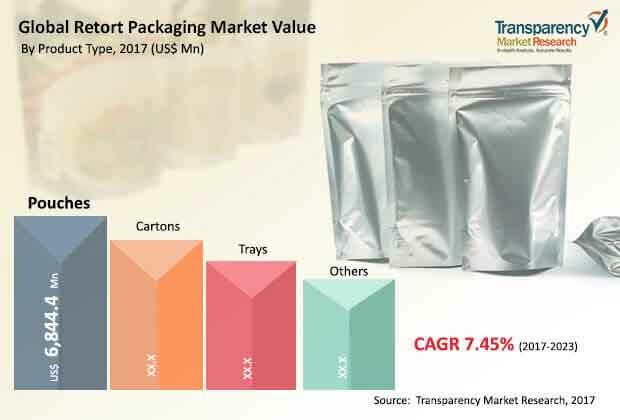 While the Asia Pacific retort packaging market has been estimated to be attain a valuation of US$8,607.4 mn by 2024, the European region is primed to generate a demand worth of 7,148.0 mn. While the Asia Pacific market is driven by its vast population and expanding population of urban population, stringent government regulations for ecofriendly products are driving the European market. In both these regions, stand-up pouches are generating maximum demand. Some of the key players in a moderately fragmented scenario of the global retort packaging market are Mondi Group, Amcor Limited, Sonoco Products, Bemis Company, Inc., and Sealed Air Corporation. The report profiles a number of prominent players of this market in its extended and featured chapter on the competitive landscape of this market.